Not being satisfied with the interpretation offered by Sankara and his followers, or some other teachers the author has attempted in the following pages to present to the readers his own interpretation of the work as hehas understood it. But in no way does he claim that his interpretation is the interpretation, i.e., the interpretation intended by Gaudapada himself. 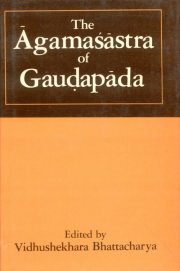 In the present volume the author has given a new edition of the text of the Agamasastra based on a number of MSS and different editions, followed by an English translation. After this comes his annotation. At the end there are Appendixes including the text and English translation of the Mandukya Upanisad, VAriants of the MSS used for the edition of the text of the Agamasastra, and different indexes. Bibliographic Information: cxlvi + 308p. Abbrev., Append., Index, Notes.